Scooper - Technology News: Highly educated women are less likely to get married, aren't they? Highly educated women are less likely to get married, aren't they? It is well known that marriage rates have been declining throughout most of the industrialised world. This overall trend has received widespread attention, and influential work has discussed the marriage market and fertility implications of women’s advancements in education and labour markets (Becker 1973, Goldin 2006, Stevenson and Wolfers 2007, Greenwood et al. 2012). A somewhat overlooked aspect of the discussion surrounding the overall decline in marriage is that the marriage prospects of skilled and unskilled women have evolved quite differently across countries. In the US, historically, college-educated women have been the least likely to marry. However, recent research has documented a reversal over time of the skilled-unskilled marriage gap, with college-educated women today as likely to get married as their unskilled counterparts (Isen and Stevenson 2010). In contrast, a number of countries in East Asia and Southern Europe have been grappling with the reverse phenomenon, with highly educated women today marrying at a particularly low rate, compared to less educated women (Economist 2011, Hwang 2015). This retreat from marriage has widespread social implications. In a new paper, we use data from 23 developed countries from 1995 to 2010 to systematically document differences in the gap in marriage rates between skilled and unskilled women across countries, and its evolution over time (Bertrand et al. 2016). 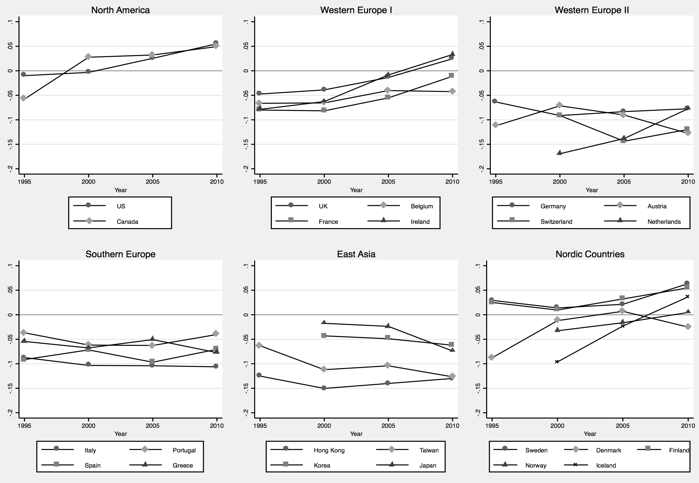 As shown in Figure 1, while skilled women overall marry at a lower rate than unskilled women, it appears that this gap has been decreasing – in some cases even reversing – in North America, most Nordic countries, and some parts of Western Europe. In contrast, the gap has remained constant or widened in East Asian countries as well as parts of Southern Europe. To explain the divergence in marriage market prospects for skilled women relative to unskilled women across developed countries, we propose a model that ties together the fact that in some countries, men overwhelmingly disapprove of married women working and the lower marriage prospects faced by skilled women. The key ingredient in the model is that negative social attitudes toward working women generate spousal disagreement over the provision of the household public good. Since skilled women have higher wages, they provide less of the public good relative to unskilled women (for simplicity, in this model, we assume that unskilled women do not work and devote all their time to household production). This tends to make skilled women less attractive as a potential partner in the marriage market. Nevertheless, as the labour market opportunities of skilled women rise, they become increasingly more attractive as husbands start to value their higher income. Therefore, assuming slow-changing social norms, the model predicts a U-shaped relationship between the skilled-unskilled marriage gap for women and their marriage rates. Intuitively, at low wage levels, increases in market work due to an increase in the market wage lowers the marriage prospects of skilled women, since the loss in public good consumption is too large relative to the husband’s utility gain from the increase in the wife’s wages. When the market wage is high enough, further increases in the market wage increase skilled working women’s attractiveness relative to unskilled non-working women, as their higher income more than compensates for the loss in utility from the under-provision of the public good. We can use this model to consider how skilled women’s labour market opportunities impact their marriage prospects in two societies, one with more traditional gender norms and another with more gender-equal norms. In the more traditional society, husbands place a lower weight on their wives’ careers and earnings. Hence the range of wives’ incomes over which husbands suffer a disutility from having a working wife will be larger than it will be in a more gender-equal society. In other words, in societies with more conservative norms, it takes a larger increase in a wife’s economic opportunities to compensate a husband for the disutility of a working wife. The model has two main predictions. First, all else equal, more conservative societies should have lower marriage rates for skilled women relative to unskilled women, and a lower proportion of skilled women. Second, the effects of an increase in skilled women’s wages will depend on the degree of conservatism of a society. An increase in wages tends to increase the marriage gap faced by skilled women in more conservative societies, but tends to decrease it in more gender-equal societies. We empirically examine the model predictions using a panel of 23 countries for four years (1995, 2000, 2005, and 2010). We focus on the marriage outcomes of women between the ages of 35 to 44, as this allows us to observe completed first marriage decisions that likely involve children among individuals in each cohort. 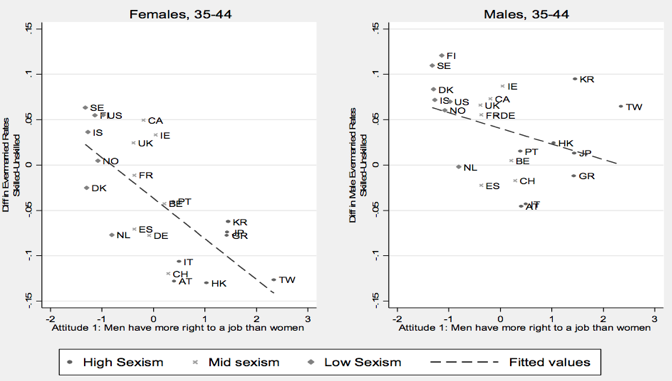 We measure cross-country differences in gender norms using responses to the statement, “When jobs are scarce, men have more right to a job than women”, from the Integrated Values Survey. We interpret agreement with this statement as expressing the view that it is more important for men to be employed in the labour market relative to women. The relationship between gender norms and the marriage gap between skilled and unskilled women age 35 to 44 across countries is shown in Figure 2. In 2010, countries with more conservative gender norms are also countries where educated women marry at an especially low rate compared to less educated women. In contrast, the relationship is much weaker for men. Our model also predicts that in more gender-conservative countries, a lower fraction of women are likely to decide to become skilled, as educated women in those countries expect that they will face greater barriers in the marriage market. This is exactly what we find – countries that have more conservative gender norms appear to have a lower share of females with a tertiary education, relative to males. Finally, we show that the relationship between the skilled-unskilled gap in marriage rates and skilled women’s labour market opportunities appears to differ markedly across groups of countries in a way that is consistent with the predictions of a U-shape relationship derived by our model. Increases in labour market opportunities of skilled women is significantly less likely to improve the marriage prospects of skilled women in more conservative countries, relative to less conservative countries. Overall, our model explains 40-55% of the observed increase in the marriage gap for the most conservative countries, and 60-80% of the decline observed in the most gender-equal countries. Our analysis provides some implications for the expected long-run trends of a troubling phenomenon in many gender-conservative countries such as those in East Asia and Southern Europe. The ‘flight’ from marriage among highly educated women is likely to translate into a decline in fertility for this educational group, reinforcing the already low fertility rates in these parts of the world. This could further slow the dynamic adjustment of gender norms to the new labour market reality if, as Fernandez et al. (2004) suggest, children of working and educated mothers tend to develop more liberal attitudes. Nonetheless, all is not bleak. Even in the presence of slow-moving norms, our analysis suggests that further improvements in the labour market opportunities for skilled women should ultimately result in improving their relative marriage market prospects. While we can only speculate how long this process would take, the fact that the marriage rate of educated women has caught up to, and in some cases surpassed, that of less educated women in more gender-equal countries should give East Asian and Southern European countries hope that the current phenomenon is transitory.